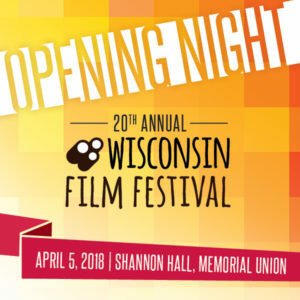 Make your film selections for the 2018 Wisconsin Film Festival by previewing film trailers at various Madison Public Library locations during this free event! The sixth annual Pinney Mini Film Festival will present short films that screened at the 2017 Wisconsin Film Festival as a special after hours event! The mini festival will feature a Q&A with filmmakers and Festival staff. Join us for one last Tuesday Night Movie Club event, a series dedicated to looking back at Wisconsin Film Festivals past. We're wrapping up with Happy Christmas (WFF 2014), and will be joined by director/screenwriter/producer/editor of the film Joe Swanberg. The Celebration will start in the Sunset Lounge at 5:30 pm for a catered reception, then move to Shannon Hall at 7:00 pm for the Golden Badger Awards presentation and our Opening Night program, Mountain. After the films, hustle down the hall to Der Rathskeller with us for a freewheeling disco dance party with local favorites, VO5, starting at 9:00 pm. Madison's favorite disco cover band takes the stage at Der Stiftskeller once again to help celebrate opening night of this year's Wisconsin Film Festival. See you on the disco dance floor! There is no entry fee for Afterglows. All are encouraged to join! The best way to cap off a day at the Wisconsin Film Festival? Chatting about the day’s films over drinks with Festival staff, volunteers, industry guests, and fellow Festival-goers, of course! Join us for delicious food, drink specials, and cinema chat. There is no entry fee for Afterglows. All are encouraged to join! Using markers, whiteboards and props, each participant will create their own short stop motion film during this hands-on workshop. All supplies and equipment will be provided. Come with an idea for a story you'd like to tell or make one up on the spot! The best way to cap off a day at the Wisconsin Film Festival? Chatting about the day’s films over drinks with Festival staff, volunteers, industry guests, and fellow Festival-goers, of course! Join us for delicious food, drink specials, and cinema chat. Live music courtesy of Madison Red and The Band That Time Forgot. There is no entry fee for Afterglows. All are encouraged to join! An informal gathering of folks who are ready to kick back and reflect on another Fest gone by.